Anxiety is a common problem and one that many pet owners find difficult to deal with. It is difficult to watch your dog be afraid, whether the fear is a result of thunderstorms, fireworks, other noises, separation anxiety or any other cause. If your dog suffers from anxiety, the Thundershirt Anxiety Wrap may be the answer for you. What Is the Thundershirt Anxiety Wrap? The Thundershirt Anxiety Wrap is a vest-like garment that fits snugly around your dog’s torso. This steady gentle pressure works to relieve your dog’s anxiety. The Thundershirt Anxiety Wrap can be used as a treatment for any form of anxiety. It works well for thunderstorm and other noise phobias but it also works equally well on dogs that suffer from separation anxiety, fear of traveling (i.e. in a car), and another form of fearful behavior. Though I cannot say the Thundershirt Anxiety Wrap works for every fearful dog, in my experience it does work well for many. It is a perfectly safe product which has no potential for side effects or adverse reactions like many of the other remedies for anxiety. If your dog suffers from anxiety, the Thundershirt Anxiety Wrap is well worth giving a try before you consider moving onto sedatives and other medications. The Thundershirt Anxiety Wrap is available in a variety of sizes to fit dogs of all sizes. In order for the Wrap to be effective, it is important to choose the size that fits your dog properly. The Wrap needs to fit snugly in order to work but it is adjustable and can be put on and taken off easily. 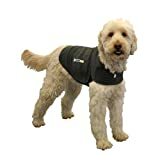 As a veterinarian, I have many clients who own dogs that suffer from anxiety and I have recommended the Thundershirt Anxiety Wrap for many of them. I’m happy to say that many of them have tried it and found it to be successful for their dogs. I would not hesitate to recommend it for anyone who owns a dog that suffers from anxiety or phobias. Find more Thundershirt Dog Anxiety Treatment Wrap products on Amazon!